Another pasta discovery was made today. Found this terrific article and message board on pasta shapes, sauces, and cooking ideas. 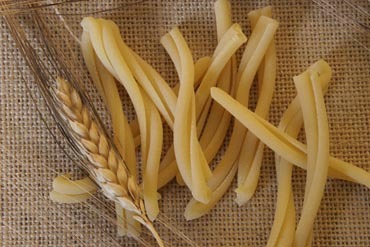 Our photo is of Festoni, a ridged shape arriving soon at Olio2go, from Pastificio Vicidomini near Naples. Pasta has been selling quite quickly and at Olio2go we are striving to order the right quantities and shapes to meet our customer’s requests. We have been quite pleased with the sales of Vicidomini, and some customers have even selected shapes from the Vicidomini site that they’d like to see us carry! On the subject of pasta shapes and recipes, Emily of Piazza Italian Market wrote a great piece. You can see it here. The platter was first layered with romaine chopped to size, topped with the scattered meats, followed by artichoke quarters, and hearts-of-palm cut to “coins”. A few marinated Sicilian olives were tossed on and a scattering of marinated sundried tomatoes, also cut to match-sticks. 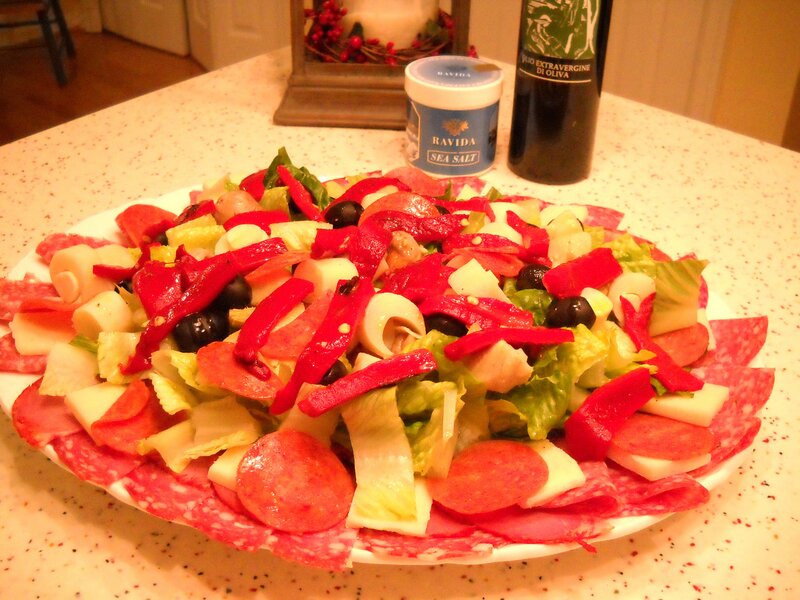 Topped with thin slices of Asiago cheese, and a few slices of pepperoni were placed around the edges for color. The SECRET INGREDIENT was added in two ways. First, it was drizzled over the composed platter and then it was mixed into a dressing with a white balsamic vinegar, one clove of crushed garlic, sea salt, and freshly ground pepper. The SECRET INGREDIENT? 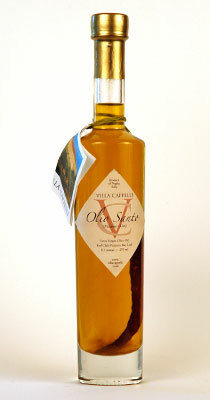 Tenuta di Capezzana Novello 2009 Extra Virgin Olive Oil. The flavor is terrific! And if you would love a great bread to go with this appetizer, what could be simpler than a crusty, rustic bread, that takes a minimum amount of work and only four ingredients: flour, water, salt, and smidgen of yeast. 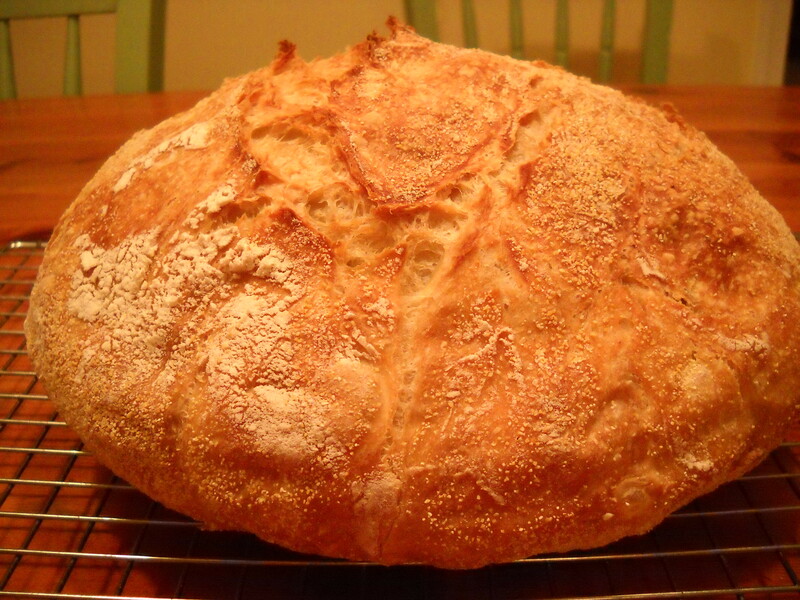 I’ve heard of No-Knead Bread for a couple of years now, but had not yet stopped to make it. But, shortly before Christmas, famed foodie and Olio2go customer, Gary V. from Binghamton, NY, convinced me to give it a try. We have made a loaf almost every day since this first (successful!) attempt. We follow the recipe originally published in the New York Times, and watched this easy-to-follow video during the first rising of our first loaf. Several batches have been made with my All-Clad Dutch Oven, and more recently, oval loaves have been baked in the crock of the crockpot, topped with an inverted baking sheet. There’s another batch rising right now.